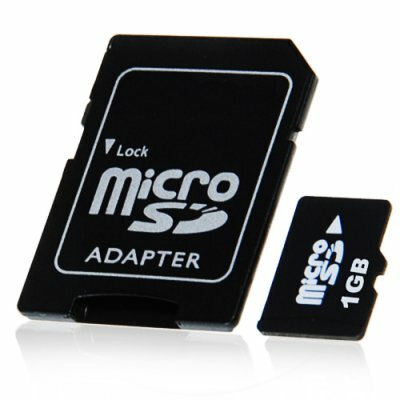 Successfully Added 1GB MicroSD / TF Card with SD Card Slot Adapter to your Shopping Cart. Micro SD card (1 GB), also referred to as a TF card, with an added SD card adapter for placing directly into a computer SD memory card slot. This new wholesale priced microSD (trans flash) card for cellphones allows you to expand the memory in your mobile so you can load up even more music or snap photos all day long! We know it can be frustrating to have a great multimedia cell phone but not have the storage capacity to really take advantages of all its media features. Well, that problem has now come to an end! An extra microSD card is also a good purchase if you are planning on transferring content to a new phone or sharing pictures / ringtones / music between friends. And the included SD card slot adapter means you can more quickly and easily load files from your computer onto the phones microSD card. Overall, a great way to improve your life with just a little cost. Don't be fooled by the low price, these are 100% factory direct brand new TF cards. The original holographic seals and individual plastic cases help ensure you get the best quality possible, while still being at a low direct to you wholesale price. We are offering this item at a quantity of at least 10 pieces in order to give you the absolute best re-sale profit margin from our low wholesale price and even better shipping rates. Brought to you from the leader in wholesale direct from China electronics, Chinavasion. Each microSD 1GB memory card comes with an SD adapter that gives you the convenience to use it as a full-size secure digital (SD) card in SD-enabled devices. Instantly move pictures between multiple devices for sharing and printing. Once you install this in your cellphone or similar device, you will generally want to format the card with your device's interface. That is because the standard format for certain phone brands, particularly Motorola, can differ from other devices. Formating for your brand cell phone ensures memory integrity and maximum speed performance.